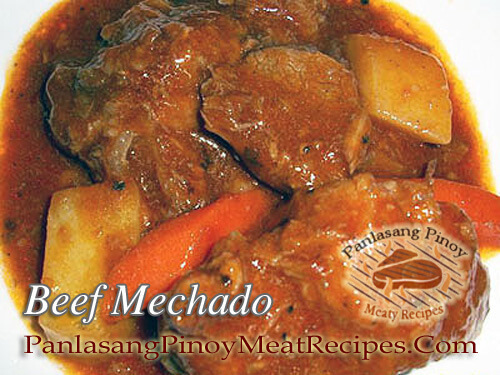 Mechadong baka is beef stew in tomato sauce, potatoes and carrots. A Filipino dish very similar to kalderatang baka and I always can’t tell the difference between the two when I see these dishes. They both have tomato sauce and potatoes but I always forget that carrot is not included in kaldereta. This mechado beef recipe version is not the conventional way, which is cooking the raw beef in the pot with the tomato sauce and spices until the meat is tender, this one, you have to stir fry the beef first which I bet enhances the flavor of the dish. Mechadong baka is beef stew in tomato sauce, potatoes and carrots. When buying the beef, choose the meat with a little tendon. Cut the beef into bite size pieces. On a heavy skillet heat oil and stir fry the beef for a few minutes until it turns light brown. Set aside. On the skillet where you fry the beef, remove excess oil and retain at least 1 tablespoon. Saute garlic and onion until cooked and add the water, lemon juice or calamansi juice, soy sauce, pepper, tomato sauce, laurel leaves, salt and the beef. Simmer in low fire until the meat is tender. Then add the potatoes and carrots. Simmer for a few minutes until the potatoes and carrots are cooked. Tip: it is better to simmer the beef in low fire so the meat will release it's flavor. I truly appreciate your collection of recipe. They are easy to follow and the ingredients can be found in any grocery store. I’ve tried several of your recipe, the most recent one of which is the beef mechado and my husband just loves the finished product. Thanks! Hi Delia Mandap, Thanks for your comment and I’m glad that this site has helped you in cooking your favorite dishes. This is awesome, my mom and I both have no idea on how to cook dishes like this. Thanks for sharing this to us! Hi Arlyn, you are welcome! Cheers!